Haley Chester is the daughter of long time Bartow County Parent Mentor Kim Chester. 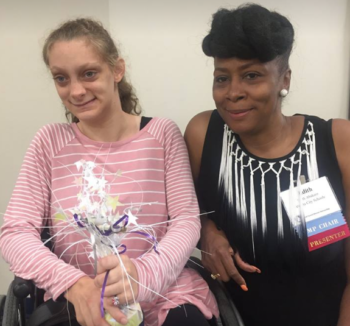 Haley and Kim shared Haley’s transition story after her acceptance into the Project Search program. What do you want us to know about Haley? Haley is a strong willed determined young lady who works hard to accomplish goals she sets for herself. She attended Cass High before going to Project Search at Cartersville Medical. Why did Haley choose to apply for Project Search? What kind of job training (CBI, or CTAE) did Haley receive prior to Project Search? Haley worked at Adams Barbecue in Cartersville through Bartow County School System’s CBI Program. What are Haley’s post secondary plans? Haley wants to be as independent as possible by doing as much with her peers as she possibly can. She would like to live with friends one day. What are her career aspirations? Haley would like to open her own business with her best friend, Dana, and her brother, Sam. They want to call this business, Sweet Shenanigans. They would take orders to make sweet treats for special occasions like birthdays and holidays and then deliver these creations to the recipients. What advice do you have for other families? 1- Dream BIG and keep that dream in sight! 2- Discuss the dream often to keep the hard work relevant. Hard work does pay off! 3- Back off and let your children soar with others. They often do more for others. Don’t keep them from trying new things or try to take away all barriers. Let them learn to navigate. 4- Support and encourage them all along the way!